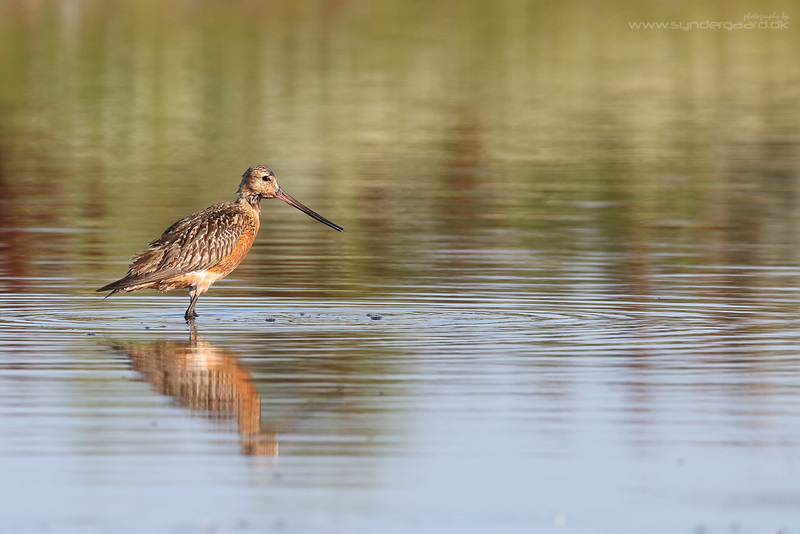 The Bar-tailed godwit (Limosa lapponica), photographed on the first morning from a little higher up than I usually prefer – but it makes for good reflections in the almost-still water. It seems to be a recurring theme on this blog, but let me just briefly reiterate; I really enjoy immersing myself in a subject, be it a travel experience, something new to learn, or a photographic subject. The subject of this blog post will be immersion, in two different subjects, as it were. On an overnight sea-kayak trip to a locality in the ‘hood I didn’t have much photo-luck at the place where I had first pitched my little tent/hide. Once I had acknowledged this fact and packed my little camp, I went exploring – and stumbled upon a true gem. The new site was a super-shallow, large lake, sheltered from the wind by low beach ridges on all sides, and teeming with foraging shorebirds. Without the hide I couldn’t get level with the birds, but I shot a number of nice reflection-images all the same, and decided to come back for more. The following morning, after a night being kept awake by hundreds of Herring gulls (Larus argentatus) spending the night around the tent, I was ready to really immerse myself in the Dunlins (Calidris alpina) foraging right in front of the hide. Super fast and super agile birds, images in flight are almost down to luck. Notice the sand flies to the left of the bird. Stocking up for the migration. The foraging is interrupted by plumage preening, which is always followed by a good flap of wings. This is my one-legged friend. He’s doing alright for a disabled bird. Give that rag worm a good shake. Sometimes you need to pounce to catch the worm. What looks like a foot in full stride is actually a rag worm, wound into a knot.